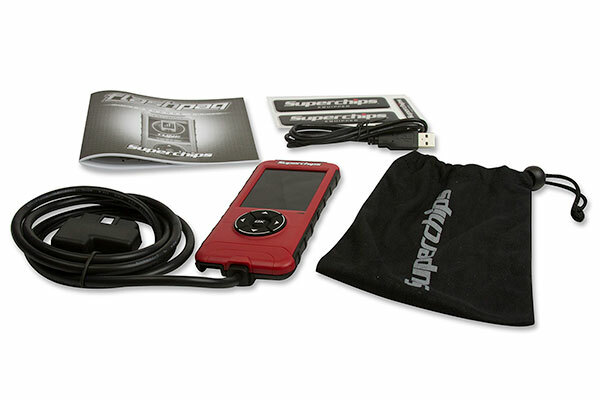 Superchips Flashpaq F5 Tuner - FREE OVERNIGHT SHIPPING! When it comes to getting the most out of your under-the-hood upgrades, nothing pushes your performance to the peak like a Superchips Flashpaq F5 Tuner. 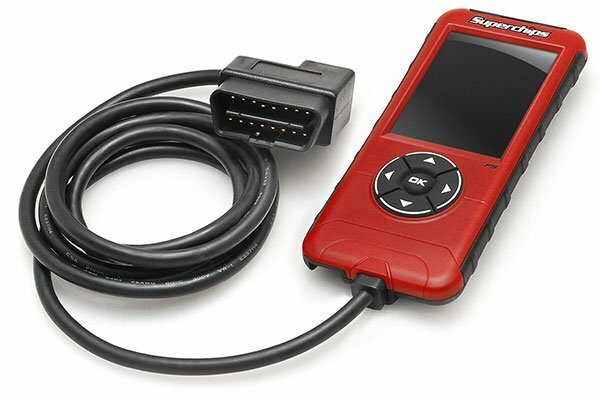 With a high-definition 2.8” full-color screen and easy-to-use graphic interface, this versatile Superchips F5 Flashpaq delivers easy power gains for your gas or diesel ride. 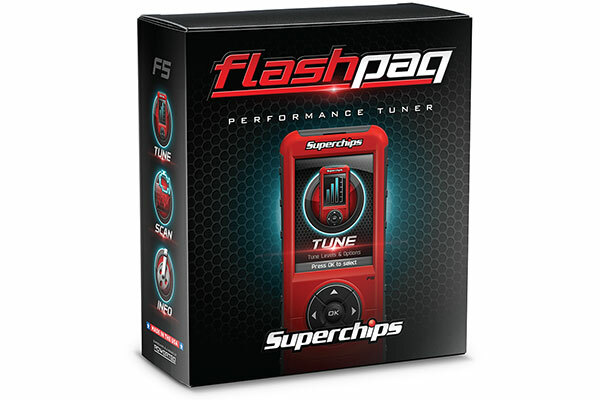 Rather than wrenching all weekend long, the Superchips Flashpaq increases your vehicle’s horsepower, torque and throttle response in a matter of minutes – just plug it in and play. And thanks to increased memory and a high-speed processor, you’re guaranteed faster upload times and lightning-quick tunes. 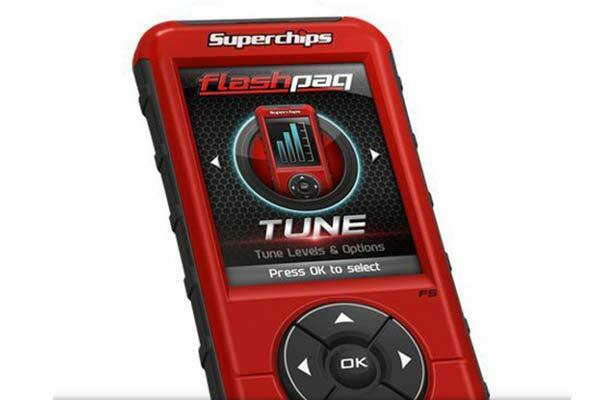 Whether you’re looking for better fuel economy, backbreaking power boosts or just need to keep an eye on your engine’s vitals, you’ll get what you’re looking for from this advanced Superchips Flashpaq Tuner. Your Superchips Flashpaq F5 Programmer is covered by a 2-year manufacturer warranty and 2-year powertrain warranty. 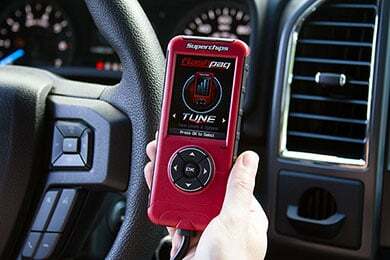 Finally bought the tuner for my 2010 Dodge SLT. I put the 87 octane tune in and all I can say is wow! It made a big difference. I was able to disable the speed limiter and the cylinder fuel shut off. I got tired of the truck sounding like a Briggs & Stratton in high grass going from 8 to 4 cylinder and back. Ran the 87 octane for a couple of weeks and now have the increase gas mileage tune in. Going on a church trip and pull a trailer 1500 miles round trip. Will try the tow/haul tune. the fuel mileage on any setting is no better than stock sometimes you have to down load everything twice to make it work and sometimes you have a blank screen on radio when you crank it up and have to cut it off for 10 minutes to reset to show the screen. Awesome tuner and easy to use. First time ever buying a tuner and glad I went with the super chips flashpaq5. Bought bigger tires for my silverado and wanted something to calibrate my speedometer for the new size difference. I have had the Rousch re-tune on my Ecoboost. This is a better fit, I can throw a tune on it in under 5 minutes and can change several options. You'll like it. This unit showed improvement in acceleration, smoothed shifting, and gas mileage. I installed KN cold AIR, many miles ago, thought about this type of equipment, but held off. Thoughts were that they do not make that much difference. I was way wrong. Buy this unit and you will not be sad. My truck is the 5.0, ran the performance set up, not they one for 87. But use 87 from top name stations, here in FL. Reference # 762-508-028 © 2000-2019 AutoAnything, Inc.